This job is not finished yet but you may be interested in the design. 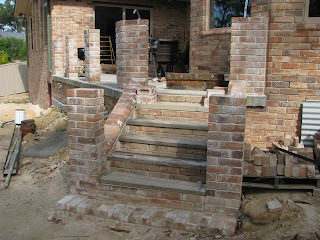 The steps lead up to our rear verandah. The piers will be capped with 50mm rock-face sandstone and some form of balustrade will run between the piers and down both sides of the stairs. The treads will be 50mm bull-nose sandstone including the long ~2m bottom tread. This photo (right) shows the use of plinth header and plinth internal returns on the risers. 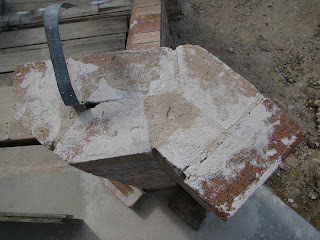 I had these as left-overs from the house where I used them in a similar way as sills (see photo above). You can also see the squints that make up the 135 degree corner of the pier and the house (see photo above). The next photo (below) shows the plan view to the fancy pier. This strap will be used to tie down the pier to the verandah slab. It will be attached to a large steel plate under tension (hopefully) and the sandstone cap will be laid with a lime-cement mortar.